Performance. A simple eleven letter word that is turning the Indian motoring scene on its head. And it isn’t just Mercedes or BMW who are flooding the market with their AMG or M Performance injected lunatics. Performance, is filtering into the lower rungs of the market. You might not notice, but there are little hatches that pack over a hundred horses under their hoods. Let’s figure this out from a manufacturer’s perspective. Until now, majority of car buying folks couldn’t care less what amount of power their cars made - as long as it kept their wallets happy and gobbled up the family with their luggage. What this meant, was that the market was bombarded with dreary commuter class engines which were meant to sip through a pinched straw. The voice of the enthusiast was drowned out amongst shouts of ‘Kitna deti hai?’. The enthusiast could do no more than sulk and try to make light of the situation. A few careless whispers were responded by Fiat with the GTX, Skoda with the vRS and Ford with the 1.6S. But all these cars come from a different era of motoring in the country. Yes, you can point to an era where the Honda City VTEC went head-to-head with the Baleno, but those days are long gone. For the most part of the last decade and a half, there weren’t options to choose from, for the enthusiast..
Thankfully - now they do. At least two to begin with. The hatches in question are the Polo GT TSi and the Abarth Punto. While the GT TSi merely sparked off the hot hatch segment a couple of years back, Fiat has gone the whole hog and brought the whole bonfire to the party. How do the two stack up? Let’s get one thing clear off the bat. The GT TSi is not meant to be an out an out performance hatchback. It is something that happens to be quick by virtue of it’s motor and gearbox combo. The suspension is not a whole lot different than the standard car either. The Abarth on the other hand is meant to do performance and nothing else. Be quick, stitch bends and shred some tyres. That is the checklist you should have if you own an Abarth Punto. The GT is way down on power - there’s a massive 40 BHP differentiating the two. Inspite of the huge difference, the GT is only about a second slower from a naught to 100. On our test runs, the Abarth managed a time of 9.17 seconds, while the Polo managed a 10.12 seconds to hit the ton. Dial in the fact that the DSG ‘box on the Polo won’t let you build the revvs for a launch, the 10 second time is properly respectable. Not taking away anything from the Abarth though. In the right conditions and with the right driver at the helm - the Abarth can hit the ton in the claimed 8.8 seconds easily. The launch on the Abarth will be as good as the driver is. To get to that magical claimed figure, one will have to battle a lot of torque-steer. At the same time, you’d need a lot of effort to not let the engine wheelspin all the power away. Let me tell you this - launching the Abarth cleanly, is a task in itself. On the other hand, there’s nothing much you can do in the Polo. Slot it in D/S and mash the throttle as hard as you can. There’s no drama whatsoever. This is exactly where the purists will cringe, for they are a breed that prefer all things analogue. Also, if you try and have a bit too much of fun with the German, the traction control will kick in and cut the power off. Not the best feeling in the world admittedly, but then, it is just trying to keep you well. The Abarth doesn’t get any of those fancy electronics, it is as pure as a driver focused machine can get at the moment. Everything happens the way you want it too. The gears, the revvs, the traction - everything is as good as you are. The way these cars catapult off the line is pretty similar. When you stomp on the A pedal, the revvs climb a bit too quickly. Both cars will hit their 6500 rpm redline in no time. While you’d be fiddling with the clutch and the stick-shifter at this point in the Abarth, the GT will already be past 3000 clicks in 2nd. That is how fast the DSG box is. One, and just one teeny tiny slip up from the person piloting the Abarth and the GT will reclaim lost ground in no time. The Polo has just enough grunt to NEVER let the Abarth disappear into the horizon. Trust me, we tried. With the Polo going well over it’s claimed top-speed, the Abarth was a car length ahead - maxxed out as well. This is where I give the little 1.2 TSi some credit. It isn’t easy putting up a fight against a hot-blooded Abarth, but the GT does it just fine. Where the VW will fall behind though, is when the going gets twisty. The Punto is absolutely fantastic through the bends, stitching corners whilst riding flat. The 30mm drop and stiffer springs have clearly negated the body roll - there’s very little lean into the bends. The hydraulic steering is an absolute delight to use and the feedback is nothing short of lip-smacking. The only part that takes away from the experience is the gearshift quality. The rubbery feel will do all it can to kill your corner carving endeavors, which is a shame considering the car is meant to be fun. In the corners, the GT loses out on three counts - the steering, the tyres and the soft (er) suspension set up. While the feedback from the wheel on the Polo is brilliant, it has a hint of artificiality to it. The steering does most of the work for you, but, at the same time does not make you feel disconnected. And when you are hitting the bends, leave the gearbox in Sports - it isn’t the sharpest in Drive and will upshift at every given opportunity. Also, if you need the best experience whilst on a set of corners, slot it into Tiptronic and take charge of the gears yourself. While it isn’t as engaging as a proper manual stick shifter with a clutch, it comes a close second. Lastly, the Abarth gets disc brakes on all four, while the Polo has to make do with discs at the front and drums at the rear. Under hard braking, the Abarth will squirm and wiggle a little - whereas the VW comes to a dignified halt. No surprises here, considering the little German is loaded to the brim with abbreviations like ESP, ASR, XDS and some more. We were pleasantly surprised by the Apollo tyres on the Abarth. They did squeal and protest a lot, but gripped very well. But if you keep at it, the Abarth will understeer and run wide - solely due to the tyres giving up way before the car does. The Polo, depending on your luck - will be equipped with either Goodyears or Apollos. Either of them do just about enough to keep the GT planted. If you plan on driving these two cars spiritedly all day, everyday - it is advisable to upgrade to fatter, stickier rubber. When you are done belting both these cars around the city and just want a quiet drive back home, the Polo will spoil you silly. You’d actually question if it is the same car that obeyed your command of attacking that corner over-zealously. After a hard (and fast) day’s of work, it is the Polo that will be the more comforting of the two. The gearbox will upshift into 7th at 60 kmph and chug along the road as calmly as a labrador. The Abarth on the other hand is stiffer, it’ll thud through the potholes. Couple that with the iffy ergonomics and the not so comfortable seats, the Punto makes sure you are tired at the end of the day. The Italians and the Germans clearly went to two different design schools. While the Abarth screams ‘Look at me! !’, the GT TSi carries the same sophisticated demeanour that the standard Polo does. People wanting exclusivity will love the styling on the Abarth. There’s a whole lot different than the standard Punto Evo. The Abarth also gets a neat set of Scorpion Claw alloys shod with 195 section tyres. The ride height is dropped by a whole 30mm, which improves the stance of the Abarth greatly. And then there are the loud red stickers - front to back, side to side and on the roof as well. All the Fiat badges make way for Abarth ones, inside out. There’s absolutely no mistaking the Abarth for anything else. The VW, will appeal to people who prefer sleepers. The GT incorporates all the changes that came with the Polo facelift. It gets the revised bumpers, smoked headlamps but retains the old 15” wheels. That said, there’s absolutely no distinguishing the standard Polo from the GT spec, save for some badging, different rims and the blacked out spoiler and wing mirror. It will really take a keen-eyed enthusiast to spot the wolf in sheep’s clothing. Both the Abarth and the GT have the same interior layout as their ordinary siblings. The Abarth does get its set of distinguishing features, though. The revised instrument cluster, red and yellow double stitch on the seat, Abarth scuff plates and pedals do just enough to remind you that you are at the helm of an Abarth. The Polo gets some piano black on the centre console and there a couple of additions like GT Scuff plates, Aluminium pedals and some different upholstery too. But the differences are so minor, that you’d be forgiven if you missed them. When it comes to build quality, the Polo trumps the Punto. Inside out, it feels like a better built and finished car.The Germans definitely know a thing or two about quality. A lesson that Fiat needs to learn. Inconsistent quality at that price point is simply not acceptable, no matter what engine the car has. The timeless design on the Polo will age gracefully through the years, that’s a given. Poles apart, that is exactly how the design philosophy is on both the cars. While many GT TSi owners wished their cars stood out from a sea of ordinary Polos, Abarth owners will have no reason to complain. The Abarth does stand out, but it is still the GT that has the better design amongst the two. The differences between the two cars aren’t black and white, sadly. It’s a big patch of grey. When you get inside the Polo after driving the Abarth, you feel you are driving something that is setup much softer. Heck, the Polo might even seem slightly tame to some. But then, you are floored by the build, comfort and not to mention - the convenience. And the GT TSi is not a slow car by any definition, is it? Well since a million people asked me which one is better amongst the two, here’s the answer. 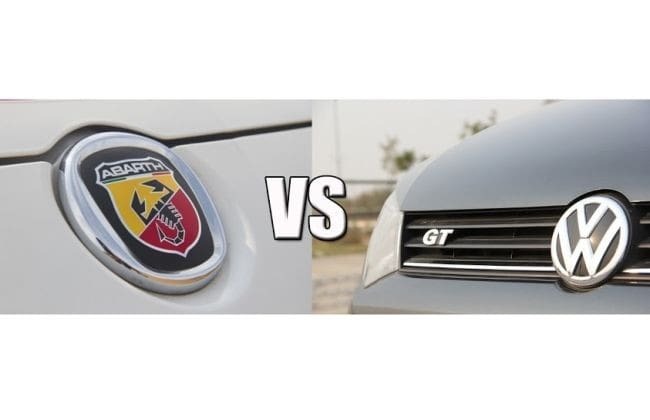 Comparing the Polo GT TSi to the Abarth Punto is akin to comparing the Jack of all trades to the Master of One. The Abarth does just one thing - go fast. It does it damn well. It is the master. The Polo on the other hand, is a well built, well-rounded hatchback. It definitely is the jack of all trades in my books. The Abarth is definitely faster, but the Polo is the better car.